The Potassium Ion-Selective Electrode can be used to measure the concentration of potassium (K+) ions in aqueous solutions. The Potassium Ion-Selective Electrode makes the measure of potassium ions portable. 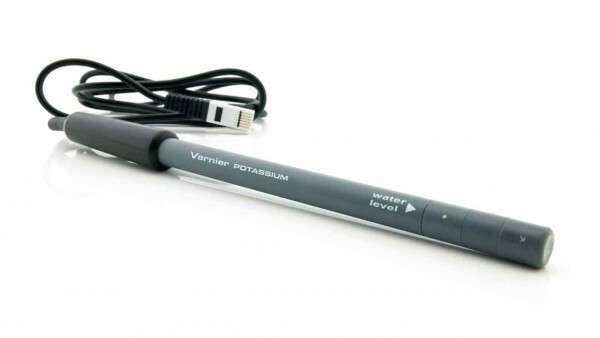 When used with a Vernier LabQuest 2, the Potassium ISE can be used to take readings in the field – at lakes or streams. This sensor is easier to set up and use than other methods of measuring potassium ion concentration in aqueous solutions. Because it is a stick-style sensor, its use is similar to using a conductivity probe or a pH sensor in a laboratory setting or in the field. Ion-Selective Electrodes require good chemical technique and careful calibration to obtain accurate results. They are not recommended for middle school or elementary students. Weiterführende Links zu "Ionenselektive Elektrode (K)"
Weitere Info "Ionenselektive Elektrode (K)"
Kundenbewertungen für "Ionenselektive Elektrode (K)"